We are so lucky to have Whole Foods as a sponsor and donor to the Philadelphia Honey Festival (especially the South Street and Callowhill Street stores). They helped fund the Friday Pollinator Power children’s program at Wagner, plus they are donating food and drinks for other days of the festival (which they’ve done past years as well). Enjoy this guest blog post from them! Did you know that 85% of fruits and veggies depends on pollinators? That’s one out of every three bites of food! We’d be a pretty shabby place to shop without honeybees, bumblebees, hummingbirds, monarch butterflies and fireflies. That’s why we here at Whole Foods Market are elated to be supporting Honey Festival 2015 again this year. Check out a few ways you can help save the bees as you cruise the aisles! Get to know “Responsibly Grown”: Look closer, and you’ll see “Good,” “Better” or “Best” all over our produce department! These orange, yellow and green stickers indicate how the fruits, veggies and flowers were grown. Stickered suppliers use sustainable growing practices, including GMO transparency, water conservation and farm worker health and safety. And if you’re passionate about pollinators, look for the “Best” stickers – these fruit and veggie farmers also plant bee-friendly wildflowers and take steps to protect insects from harmful chemicals. Get to know Responsibly Grown even better! PS: By choosing organic food in general, you’re supporting farm practices that promote healthy ecosystems and avoid toxic and persistent pesticides. Try our 365 Pollinator Friendly Almonds and Almond Butter: Almonds depend on honey bees and other pollinators to bear fruit. However, almond trees only flower in the winter. Farming monoculture (i.e. when land only grows one crop, like almonds) makes it hard for bees to find food year-round. That means almonds are increasingly rely on commercial bees whose massive bee hives are actually trucked from one farm to the next. Crazy, right? 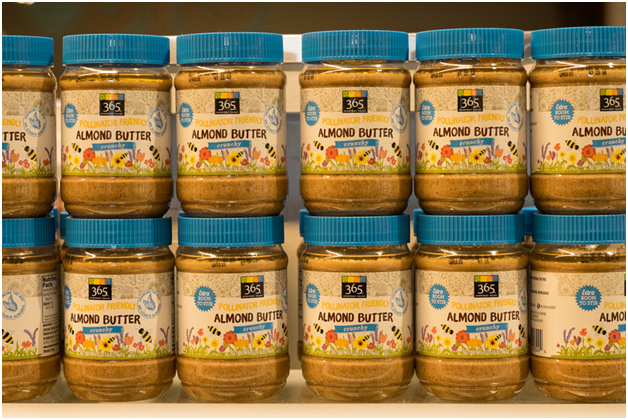 This year Whole Foods Market introduced our 365 Everyday Value® Pollinator Friendly Almonds and Almond Butter. Sourced from an orchard that works with The Xerces Society to plant diverse wildflowers around the almond trees to provide year-round sustenance for local bees. Look for our bee-friendly suppliers: Whole Foods Market collaborates with supplier partners who support bees and pollinators including Cascadian Farm and Blue Diamond. Cascadian Farm makes delicious cereals and granola bars, but they also protects pollinators by farming organically and donating to wildflower restoration and bee research. Blue Diamond Growers — suppliers of Almond Breese almond milk, crackers, canned nuts and more — supports pollinators by planting diverse ground cover around their almond orchards and donates to research on bee health. Good for you, and for the greater good! Mark your calendar for our “5% Days”: On select days throughout the year, Whole Foods Market stores donate 5% of sales to a local non-profit organizations. Customers and supporters raise funds just by shopping! 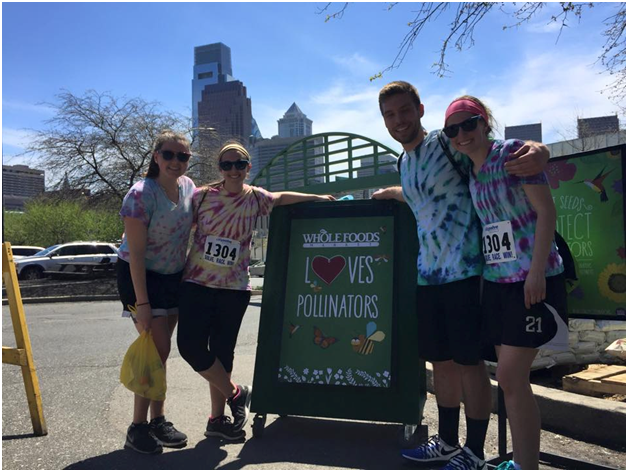 Thanks to the overwhelming support of our shoppers, we were able to donate over $7,000 to the Philadelphia Beekeepers Guild this spring! Funds have financed a “nuc” hives. These apiaries (e.g. bee hive yard) hold brand-brew hives that are helping to alleviate bee colony collapse right here in Philadelphia! Plant seeds and starter-plants: Whether you have big, beautiful garden or just a potted plants in the window, planting bee-friendly plant species is fun and makes a big difference to these little guys! Colorful flowers, fragrant herbs and burgeoning berry bushes are all great options that will bring a little extra life to your home or yard as well as the local ecosystem. Check out our seed rack and gardening section for more ideas! « Mommy Poppins Picks Us!